Bree stretches to set the table. It's good for kids to stretch to do complex and high chores. Some 94 percent of children are spoiled reports Richard Bromfield, a psychologist who works at Harvard Medical School and author of a new book, “How to unspoil your child” written up in the Boston Globe yesterday. That is a wonderful concise simple concept. 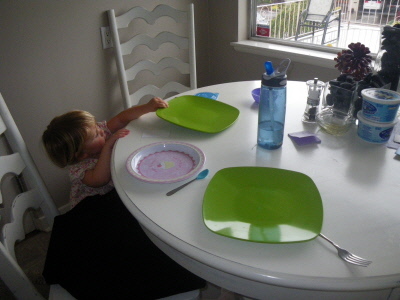 When parents give and do less, children have to give and do more, which means they can start setting the table before they can reach the table, like Bree. 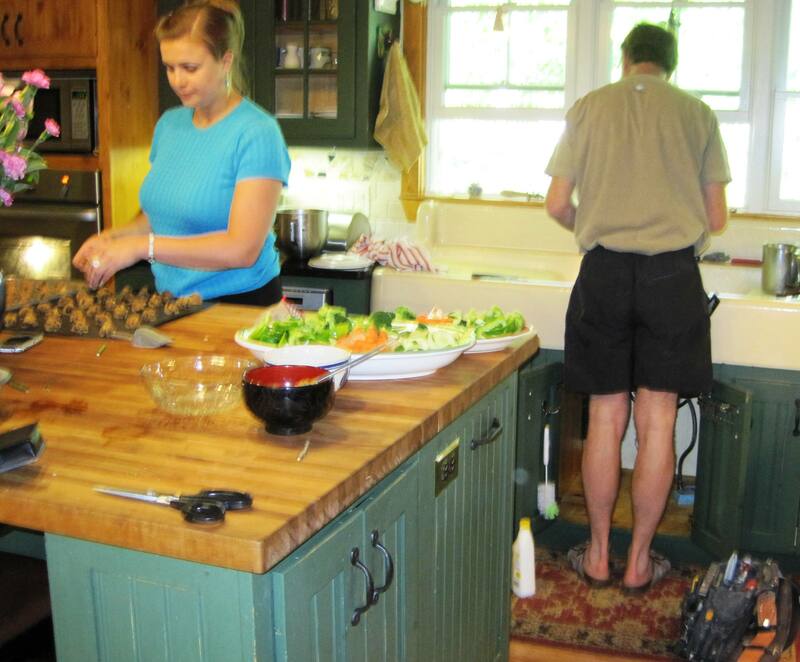 They can do the dishes every night, empty the dishwasher, cooking and doing yard work as a family, light housekeeping and as the children mature, take on bigger family projects together. The daily ritual and responsibility of doing dishes every night is a way for children to do more. It benefits them and their family because children will feel connected to their families, and family connection is critical according to the National Longitudinal Study of Adolescent Health. One of the key ways to insure healthy teens is for them to feel connected to family and school, according to that long-term comprehensive study of 15,000 students in the wake of the Columbine massacre. Parents flex what I call the TripleEe — empowerment, expectation and encouragement — when children do chores. Chores empower children by giving them self-confidence, self-discipline and responsibility. Expecting and encouraging children to do chores is the most effective and peaceful way to involve children in family housework. To get your family going on chores start with a family meeting. See my free Tip Sheets on family meetings and “Give me a job.” Parents have the added benefit of being able to retire as the house servant when they unspoil and empower children with chores. It’s fun to work together and many hands make light work, even if the hands are little and it takes extra time to include them. It’s well worth the investment. Calling photos of children — even you — doing chores. Win $50. 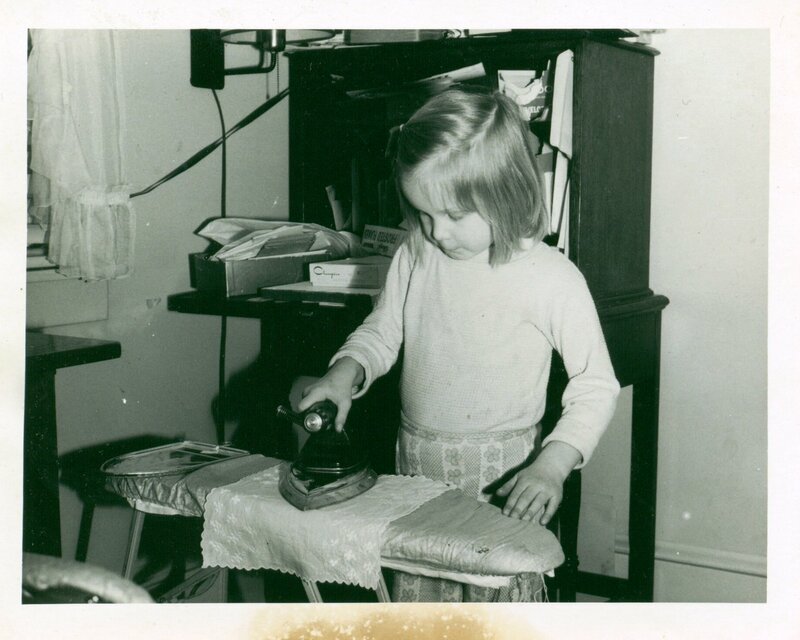 That's me ironing at age 5 in about 1963. I eagerly waited for handerchiefs, dresser scarves and pillowcases to iron. This photo says so much about how my parents raised their nine children. We all had chores and those chores taught us self-discipline and nurtured our self-esteem because we contributed to the family. Today, most of us are in business for ourselves. We’re very self-directed and I attribute that to doing dishes regularly. Do you have a photo of YOU doing chores? Or of your children doing chores? Post it on my Raise Able Young People Facebook page. 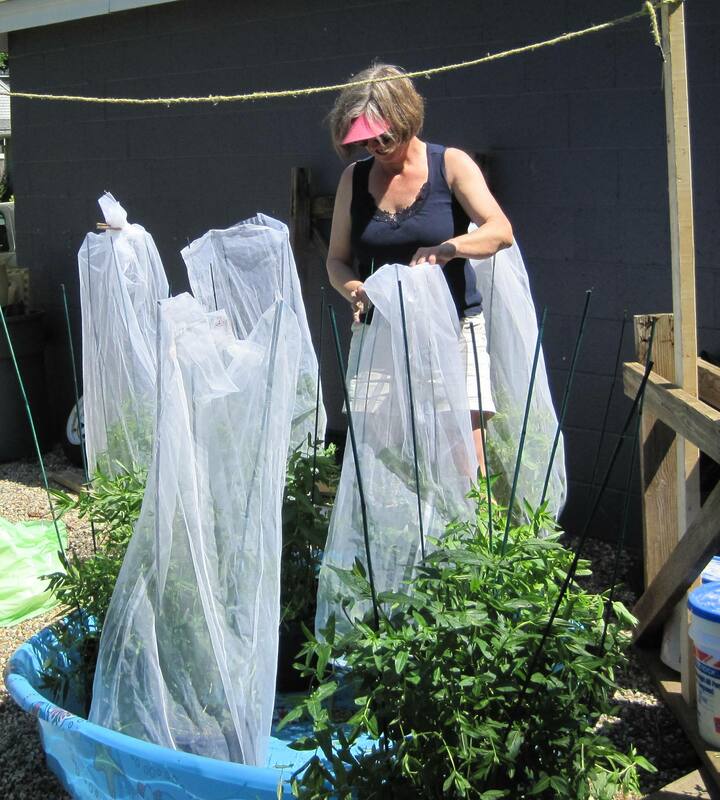 While you’re there, vote (LIKE) for your favorite photo of a little person working. The winner – to be determined by Sept. 7, 2010, will win a $50 gift card. Chores are the anti-brat remedy. It’s impossible to be entitled when you take out the trash, scoop dog poop and sweep floors. Chores teach children about life. Sometimes we have to do things whether we want to or not. Some of my best memories growing up are doing dishes with my brothers and sisters. It was fun to rake leaves, clean out the garage and paint the house together. I felt important. I loved when I was old enough to paint a radiator while my older brothers painted the walls. They carefully instructed me, “Watch out for drips!” I didn’t know that painting radiators was boring and time-consuming. I relished being part of the action. Painting the radiator was challenging. Instead of bugging them or tagging along with them, I was helping. Comments: Comments Off on Calling photos of children — even you — doing chores. Win $50. The book launch party was a success because of my support crew. So many people came from so many areas of my life, it was like a big birthday party for me. I really appreciated the love, support and encouragement. 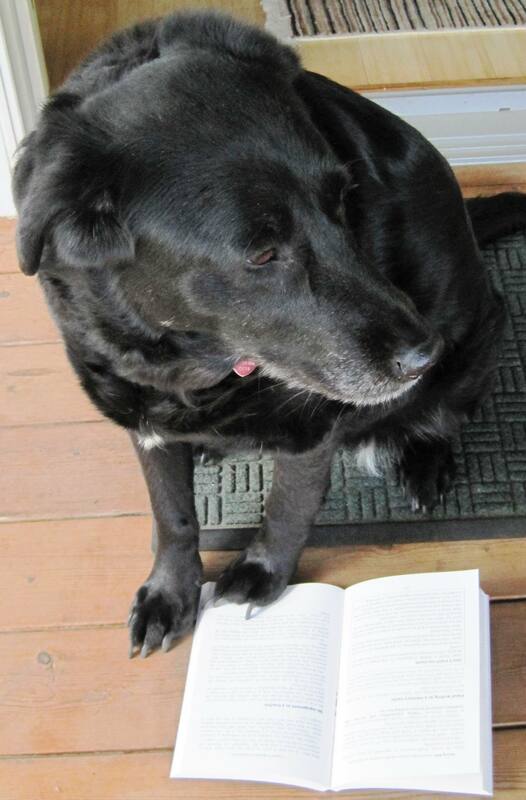 The dog started reading the book and had some comments. I really appreciated my daughter Casey’s contributions as official party helper. It made the party much more fun and less stressful. I felt supported and loved. My son Noah came to the party and I forgot to give him a chore. Oh well, he would have if I asked. I was happy he came. I'm not motivated by money, either. My support system for the book launch party. My eldest daughter Casey is making chocolate chip cookies and my husband, Reliable Bob, is fixing the faucet that broke 15 minutes before the party started. This tip for family meetings comes from deborah@fiveminuteparent.com. I love it. It adds spice to family meetings and gives everyone something to look forward to. It builds family fun into the meeting. Having a family meeting somewhere fun is like an off-site business meeting that puts everyone into a jovial mood. Where would you have your ideal family meeting? Where are you going to schedule your next family meeting?